A night night with a cheetah at Jamala Wildlife Lodge. One of the many reasons that people check in to hotels is a little solitude from the Sturm und Drang of everyday life. But lying in my luxuriously appointed hotel room in the dead of night. I am almost willing the silence to be broken. And then I hear it, an almighty commotion from the room next door. It’s hard to tell if it’s an argument and at any other hotel I’d be demanding that the disturbance be dealt with, but instead I just lie there in awe. You see, the occupants of Bungalow 1 next door are not quarrelling newlyweds, they are a pride of lions. It’s the kind of experience that safari camps in Africa pride themselves on delivering. But I’m not in Africa. My 11-year-old and I are at Jamala Wildlife Lodge, a 10-minute drive from the centre of Canberra. 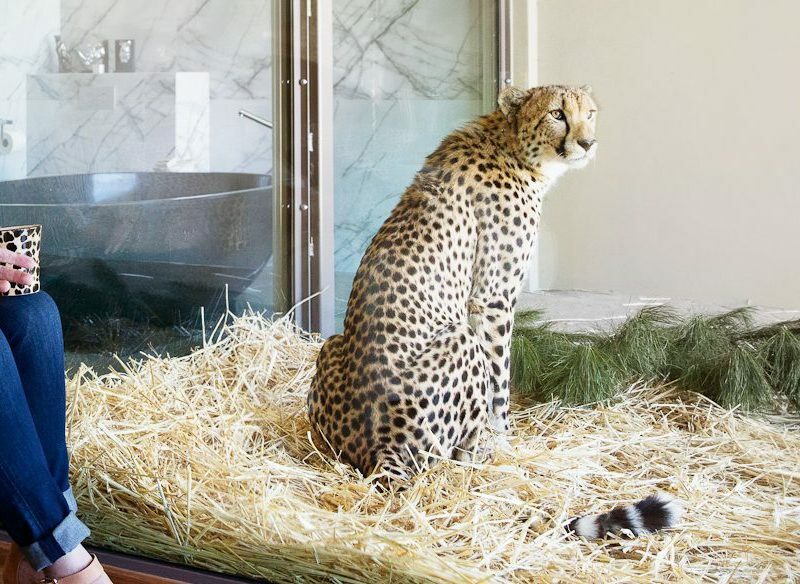 Part of the privately owned National Zoo and Aquarium, Jamala Wildlife Lodge is the passion project of Richard and Maureen Tindale, who, in 1998, bought an aquarium and small native wildlife park after it went into receivership. Almost immediately they set about expanding the property, with a mission of housing animals in as comfortable surroundings as possible, aiming for best practice when it came to animal welfare. Many of the animals they initially brought into the zoo had spent their lives in circuses and were in desperate need of love. In the 17 years since, the zoo has continued to take in animals in dire straits, growing in size and contributing to international breeding programs, while educating visitors on the importance of wildlife conservation. The lodge offers guests the chance to spend time with some of the most endangered animals in the world, from the comfort of five-star facilities. All of the rooms scattered around the zoo are directly adjacent to an animal enclosure, with just floor-to-ceiling walls of glass separating man from beast. The rooms in the central uShaka Lodge overlook the likes of lemur, hyena, shark, and cheetah; six Giraffe Treehouses allow guests to feed the resident giraffe, Hummer, from their balconies; and the Jungle Bungalows look out over lions, cheetah, tiger and brown bear (conversely the animals can look in at the humans, including in the bath). Our room, Bungalow 2, is directly adjacent to the Malayan Sun Bear enclosure, and when we enter (walking past a cute as a button red panda munching on bamboo) we find Arataki, the man of the house, sprawled outside the window determinedly working his way into a coconut with his enormous claws. His partner Otay was rescued from Cambodia where she was being held in a cage until she was old enough to be sold to a restaurant – their paws are made into soup. It is impossible not to be totally transfixed, given that a Malayan sun bear is mere centimetres away. Later at dinner, which is taken as a group safari-style back at uShaka Lodge, the zoo’s keepers coax a pair of white lions up into an enclosure on the verandah where pre-dinner drinks are taken. The majestic beasts are close enough to reach out and touch (not advisable). While this kind of encounter may seem contrived and the opposite to being ‘in the wild’, many of these animals have never actually been in the wild. It is a fact that hits home the next morning when we set out on a behind-the-scenes tour of the zoo. We stop at the Sumatran tiger enclosure and hear about their plight: deforestation in pursuit of money from palm oil harvesting is wiping out the big cat’s habitat at a sickening rate. In a mere 20 years, the only place you will be able to see these tigers is in zoos; they will be totally extinct in the wild. And that’s where the gimmick of sleeping next to lions and tigers and bears becomes a serious attempt to stem the tragic flow of animals that are endangered. The funds raised from the room rates at Jamala go straight back into the zoo, allowing it to continue to strengthen its breeding program. As we wrench ourselves away from Arataki and Otay to check out of our room in the late morning we glimpse the young couple who spent the previous night beside the raucous lion family. Like most of the other guests they look happy, if not just a little tired.